UGC NET Lectureship Interviews – Tips, Questions & Answer Suggestions! Appearing in Lecturer-ship Interviews after qualifying the UGC NET can be a nerve-wracking experience for the applicants! It’s quite a tough task to sit in front of the panel of experienced educationists who are judging your every single moment and every word you speak. The most challenging part comes when you need to present your views and thoughts in such an impressive way that the interviewers get convinced to hire you. Make sure you’re very well prepared for the UGC NET Lecturership Interview Rounds. Because opportunity does not knock twice! You and only you will be responsible for turning the Interview Results either in a Milestone or in a Failure. Achieve UGC NET qualification with sample study material and theory content! Grab it Soon! Things to do before going for an Interview! Most Frequently Asked Questions in interviews and their Answers! 10 Interview Ethics Every Candidate should follow! 9 Things to do before going for an Academic Interview Round! Practicing beforehand and being very well prepared will always keep you at a safer side and boost up your winning chances as well. Everything you do to prepare ahead of time is very crucial! 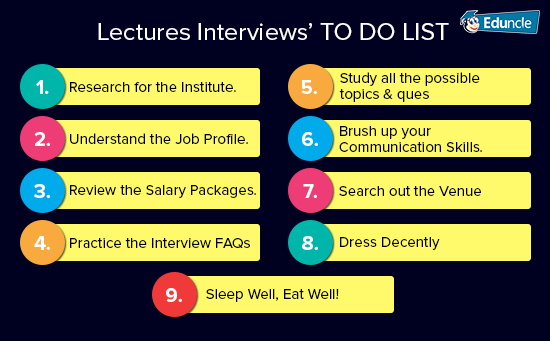 To make you aware of all the Interview pre-requisites, Eduncle is providing a ‘To Do List’. Save this list and perform the suggested tasks one by one to get better results in Academic Interviews. For a smart preparation approach, we are providing some Important Interview Questions that are frequently asked during the Lecturers Interviews. Also, read out the correct answers for the same. Most Frequently Asked Questions in Lecturers Interviews and their Answers! After trawling through numerous questions and consulting academicians and fellow men you have had a good hand at taking academic interviews; we have concluded and figured out few of the most commonly asked questions with the appropriate or likely answers. 1. You don’t need to answer in the same way, we’ve written below.Be your own hero! Implement your own style while answering the questions during Interview Round. 2. Be Specific, Truthful & Confident! This will reflect your personality. Ques 1: Tell us about yourself. This will be the first common question. Keep your introduction short & sweet! Tell them about your name, education background including the subject for which you will be teaching the college students, interests, job experiences and what achievements you have gained in your life previously. Ques 2: Why do you want this Job? If this is the opening question, don’t miss out this excellent opportunity to create a dreadful impression on Interviewers. Be confident and specific about your goals and answer positively about the same. It’s very important to structure your answer well. Just a few seconds thought before answering can help you state the points in an accurate manner. Don’t take long for thinking. For example, "There are three main reasons why I see myself as a good fit for this role". Ques 3: What Educational Qualifications do you possess? While explaining your academic background and educational qualification, use a professional tone to highlight the awards and degrees you have achieved. And, mention the certificates or project/research experiences if you had in your student life. Do not just tell about your percentages! Ques 4: What is your Teaching Philosophy and what innovation would you like to bring? This question’s answer might create your highest impact on the Interviewers. As you would be teaching the College Level Students, so being innovative will be the top most requirement for this position. You must inherit the innovative teaching style to stand out amongst other candidates. Here with the answer of this question, you can tell them that why should they hire you! So, gather up all your teaching experiences, choose the one that people liked the most and then answer confidently. If you had any previous teaching experiences, then to you can add few points on making teaching & learning interactive. Ques 5: What teaching skills and techniques have you used over the past years? Stay Honest and answer the most favorable teaching technique which benefited your students. Ques 6: What courses are you particularly interested in teaching and Why? No need to be conscious! Simply tell them about your specialization, degrees, and experience you have for that subject. Also, justify the reason that why would you be teaching the same subject and benefit students by your teaching. Ques 7: What challenges are you looking for in this position? The best way to answer questions about the challenges you are seeking is to discuss how you would be able to effectively utilize your skills and experience to resolve those challenges. You can also show your interest in accepting challenges, learning from them and solve them with great efficiency. Ques 8: What do you know about Our Institute? The answer should be based on your research which you had performed before coming for the Interview. Tell them about the courses which are being offered by the Institute and when the Institute was established, how many students are its members at present time and so on. Ques 9: What are your Salary Expectations? Expecting Less Salary will reflect that you are not sure about your skills. Be Straight Forward and Play Wisely here. Don’t seek for too much but at least ask for enough salary amount to proceed your career with the concerned institute. Ques 10: Do you have any questions to ask us? Never ask for salary, perks, leaves and company’s policies. You may ask more about the Institute and its culture etc. Ques 11: What makes you different from the other candidates? While answering this question, don’t go negative. Turn your answer in a positive manner and tell them about your good qualities only. Make sure you give examples from your own skills to support your assertions. If there is anything you do that makes you stand out, for an example a skill or area of experience, mention that too. Ques 12: How does your work fit with the group/department/university? Don’t be Solipsistic here because Interviewers don't recruit such candidates. Think about specialisms, research clusters, possible collaborations, undergraduate or graduate curricula, interdisciplinary links with other departments, outreach initiatives, etc. Ques 13: Where do you see yourself in 10 years' time? Reaching a higher position is awfully predictable if we calculate such long duration of 10 years. So, here think about achievements rather than status. This question also gives you an opportunity to show that you have a vision for where your field is going. Ques 14: What if your experiments fail and you can’t get success in your work? It is very important to stay confident and motivated at such bad times. Don’t lose faith in your capabilities and work done by you. Don't pretend that your research is impervious to failure. Doing so will probably come across as denial or, worse, a lack of self-awareness. The thing which matters most is how you handle the situation and overcome it. Ques 15: Why should we hire you? This is the question where you can wow them with your talent highlights. Explain 3-4 major points including your achievements, talents, strong points and your way of working to make them convinced on their question. Create Notes of all the above questions and keep learning from them! Get all the Latest Updates for UGC NET into Your Inbox. Subscribe Here for FREE ! From the selection of your attire you choose to wear at the time of the interview, the way you enter the Interview hall and even how you exit an interview, are all essential aspects that reflect how you come across as a potential employee to managers. You are being observed at every single moment during Interview Session. Interviewers will have a watch on your every single move, your posture, your look, voice, attitude, facial expressions etc. And this is the time when you can put your first great impression on Interviewers. To make you aware of all the Interview Ethics, Eduncle has listed a few important factors below. Study these essential tips for correct gestures and ethics during a job interview! 1. Greet Interviewers with a great smile and a firm handshake. This shows confidence and professionalism. 2. While sitting on the chair, keep your hands on your lap and do not cross your legs. You can either keep your crossed arms on the table. 3. Keep your posture straight. 4. Maintain a complete eye contact. And during the discussion nod your head to show that you’re listening and paying attention to what they’re saying. 5. Don’t use words like – um, like, uh, you know, wanna, gonna, cya, heya. 6. Don’t hesitate or twist your tongue while answering the questions during the Interview. 7. Don’t show any kind of negativity. Stay Gentle! 8. Show your interests in the job and the profile which they are offering. 9. Don’t lie at any point or fake for anything. 10. At the end of the Interview, conclude with another Handshake and thanks to the Interviewers for the meeting. Take Expert Advice to reach Success! Register for Free at Eduncle! Hope the above tips and ethics will help you to win the hearts of Interviewers and being recruited on the position you’ve applied for. Stay Motivated and Move Forward! All the Best for Your Future Endeavors! Would like to share your own Interview Experiences with us? Please send your stories in the comment box below! To get more such updates, Stay Tuned on Facebook & YouTube!